After a brief introduction by Simon Hancock, four members of the Society each made a presentation on the Great War experiences of their relatives. The presentations covered pre-war life and their ultimate fate. Anne Eastham spoke about her grandfather, James Hamilton Langdon Yorke, known to his family as Tony. He was born in New Zealand but returned to Pembrokeshire on inheriting the Langton estate from an aunt. 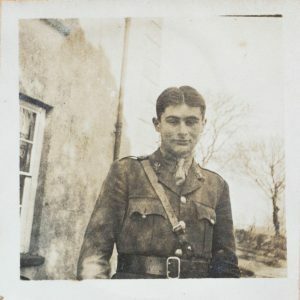 Tony joined the Pembroke Yeomanry prior to the war and embarked for service in Egypt in 1916. The Pembroke Yeomanry became part of the 24th Battalion, the Welsh Regiment in 1917. Captain Yorke took part in the fighting that led to the capture of Jerusalem from the Ottoman Turks. He was awarded the Military Cross for “conspicuous gallantry and devotion to duty. When part of the line was driven back by the enemy, he rapidly reorganised the situation with great skill under very heavy shell and machine gun fire. He showed splendid leadership and initiative”. He was killed in action on 27 December 1917 and is buried in Jerusalem War Cemetery. There is a memorial to him in Spittal church. Harry Boggis-Rolfe talked about Lionel Thomas of Trehale. He enlisted as a cadet on the outbreak of war and was commissioned into the Welsh Regiment from the Artists’ Rifles in 1916. (The Artists’ Rifles was used as an officer training unit during both world wars.) He was posted to France in December 1916. He was killed in action on 20 September 1917 during the Third Battle of Ypres (or Passchendaele) while serving with the Machine Gun Corps. He was just 19 years old. He is buried in the Hooge Crater Cemetery in Belgium. After the war, his family paid for the restoration of St Teilo’s church, Llandeloy in his memory. Edward Perkins spoke about the Johns family of Manor Owen. Five of their sons served as officers during the war. Owen fought on the Western Front, winning the Military Cross in 1916. 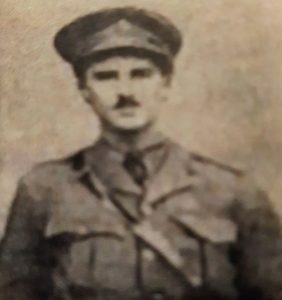 He was killed in action on 28 June 1916 while serving with 133rd Trench Mortar Battery, Royal Field Artillery during the preparations for the Battle of the Somme. His brother Herbert also won a MC while serving with the Royal Artillery. One of the four survivors, Mortimer Johns, was deeply affected by his experiences and lived a lonely outdoor existence in a hut after the war. Two of the daughters served as nurses and one met her future husband while serving. Adrian James talked about his grandfather, Tom James. He was conscripted into the Royal Field Artillery and served as a Gunner on the Western Front during 1917-18. Tom James kept a diary during the war and Adrian illustrated his presentation with extracts from the diary and post cards sent home from Bulford Camp, where Tom trained, and from France. Tom was hospitalised twice, the second time after being wounded in action. Adrian noted that strangely there was no entry in the diary for 11 November 1918, the day the war ended. He recovered from his wounds and went on to serve as part of the British Army of Occupation in Germany after the Armistice. He was demobbed in 1919 and return to Pembroke Dock. He died in 1953. The Society hopes to publish some of this material in a future copy of the Journal. Monkton Old Hall: a fifteenth-century manorial courthouse?